Having real-time alerting, correlation, analysis and auditing through your security information and event management (SIEM) and managed by a vigilent team of security experts, is essential for early warning of possible security breaches, reducing threat impact and enabling compliance with regulations and standards such as PCI DSS. Whilst many excellent SIEM technologies exist, organizations are increasingly recognising that technology alone cannot deliver the expected benefits and that they need a corresponding investment in staff, configuration, and operational processes. In practice, with the shortage in proven security expertise, it can be daunting to deliver and prohibitively expensive to build and train your own in-house team to provide your organisation with effective SIEM management and monitoring. 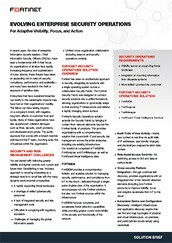 Interested in early warning of possible security breaches, reducing threat impact and enabling compliance? Just let us know how we can contact you and one of our Trusted Advisors will be in touch.